It was difficult to find the cabin. GPS doesn’t work there but after calling the office they were able to direct us there. No problem once we located it. We loved our time away with family in Adventure Lodge! The views were outstanding! We've stayed in several cabins in the area and Adventure Lodge has been our favorite! Cabin was very clean and well maintained. The location was minutes from Dollywood. We will definitely be staying here again! Beautiful views and very spacious! Would love to come back. We enjoyed our stay very much. The cabin is a good size for our family of 10. The three balconies with rocking chairs and swings are very relaxing. We love sitting out there enjoying the beautiful view. The cabin was clean and having a kitchen to cook in was a great way to save some money. We enjoyed the pool table and loved the arcade game! We had trouble with the upstairs air conditioner freezing up and not working, but when I called and told the representative about it they had a matinence man out to fix it within just a couple of hours. It was fixed that day and I was very happy about that. The only complaints we had was that while there is a lot of dishes, pots and pans in the kitchen to use to cook with there wasn't any oven mitts to pull things out of the oven and no hot plates to set things on. We ended up having to use wash clothes from the bathrooms. I would also love to see a new shower head in the upstairs bathroom. The existing one is very old and the water does not come out very well. My sons loved having the very top, small loft to themselves but even though they are young (10 and 11) they hated the mattresses up there. They said they were very uncomfortable and had a very hard time sleeping on them. All in all we had a great time. Cabins USA makes the check in and check out very easy. Not having to track down the office and get a key and then return it when we leave is fantastic! We will definitely use them for another stay in the future. The cabin was very nice. Has an awesome mountain view. The kitchen has everything you need. The beds are very comfortable. The check in process was quick and easy with very friendly staff. Will definitely rent from Cabins USA again. We loved the view. It's quite a drive and a bit confusing if you go by gps. We had 9 in the cabin and we had plenty of room. There is so much to do in the cabin and it's close enough to drive to town for other entertainment. The wifi password we were given didn't work but we called the office and they gave us a new one. We did have one major issue and that was the ceiling in the down stairs room leaked the whole week. We had to use all the trash cans to collect it. We called maintenance and they came out but no one let us know what was going to be done. That didn't stop us from having a great week and we are already planning on another trip next year. We hope the owners are able to repair the leaks so others can enjoy this beautiful get a way! Adventure Lodge was great! I was there with a group of guys for a bachelor party and we had an absolute blast. It was up on top of a mountain/hill and had great views and was secluded enough to where we could have a good time and not disturb anyone. Tons of space for everyone to sleep, cabin amenities gave us a lot to do and cable made sure we didn't miss a single game of the NBA playoffs. Would be nice if owners or cabin USA supplied numbers for taxi services in the area as uber is extremely hard to find. We ended up just driving into town which took about 25-30 minutes. We also had a very hard rain storm and the cabin took on some water. If the doors were not dead-bolted water came in and the windows has some issues. HOWEVER, we cleaned it right up with some extra towels and the maintenance showed up and assessed everything. I am sure the owners will get this fixed. Was just 1 very small blip on an otherwise amazing trip! We absolutely loved our cabin! We hope to stay in this cabin for future getaways!!! The views from the cabin were amazing. The cabin was clean and comfortable. It is perfect for a large family! We loved everything about Adventure Lodge. The location and the floor plan was perfect for our getaway. I would definitely recommend Cabins USA and Adventure Lodge to anyone looking for a rental. Our family had a great time in this cabin! We loved everything about it! The view from the balcony was amazing!! Can’t wait to come back! We had a great Christmas, partly due to our pleasant stay at a beautiful cabin. All of our contacts with Cabins USA staff were professional and felt like talking to friends. Thanks for everything. Best place I ever stayed! Loved it! This place was awesome! Adults & kids alike enjoyed it. Hassle free experience from start to finish! Thank you! - We have nothing but to offer an excellent review of this property and location. There was 7 in our party with plenty of room to sleep. We enjoyed the breathtaking view of the Smokies every morning from the decks while enjoying our coffee and planning our day. Cabin was comfortable and offered all we needed in regards to amenities. Location was awesome as we were a short drive to both Gatlinburg and Pigeon Forge. Thank you again for helping to make our vacation comfortable and memorable. The people at Cabins USA were all very nice. The cabin was beautiful and very clean and comfortable. We did have to call maintenance twice, once to get a missing foose ball and the other time the coffee maker was cracked and leaked all over the counter the first time we used it. Although it was a little bothersome that I had to call twice, the staff was very nice and quickly responded to our requests. We were only there two nights, but someone delivered a new coffee pot the very next morning just in time to have a pot before we checked out which was very nice. Also the text check out is very convenient. We will definitely use Cabins USA again. I'm am so happy to hear that you enjoyed your stay in Adventure Lodge! We here at Cabins USA work hard to make sure each of our guests have the same great stay you enjoyed while vacationing in the Smokies. When you are ready to stay with us again, please mention you are a return guest for an additional discount. Thank you again for your review and thank you for choosing Cabins USA! What a beautiful cabin/view! We cannot wait to go back...very impressed! Our family with parents, children and grandparents had a wonderful time! We loved the Adventure Lodge. It was comfortable, spacious and gave us all privacy. The loft area was wonderful with amazing views. The grandparents used that space, however, looking back, it probably should be the parents with young children because of the loft area included on the 3rd floor and Foosball. They wanted to be on the top floor! It made our trip to Pigeon Forge very enjoyable! We had a wonderful, relaxing time at Adventure Lodge cabin and not wait till our next visit. We loved the cabin and the views are awesome of the mountains and we loved the log swings and rocking chairs. The beds are very comfortable and there is 3 air-conditioned units which is great when it's hot outside. We got plenty of rest and relaxation. The cabin is private even though there are other cabins around .The location is good and you can see the fireworks from Dolly Wood.We always looked forward to coming back to the cabin after going out for the day.If you want to relax and enjoy the mountains then this cabin is a great choice. We just loved it. I am so happy to hear that you enjoyed your stay in Adventure Lodge! We here at Cabins USA work hard to make sure each of our guests have the best stay possible while vacationing in the Smokies. When you are ready to stay with us again, please mention you are a return guest for an additional discount. Thank you for choosing Cabins USA and we look forward to having you as our guest again! My family had a great time staying at Adventure Lodge. The first 3 nights we had a raccoon come visit us. It climbed all the way up to the 3rd floor deck and just sat at the door wanting in. The kids really enjoyed the games. On the back decks you have a beautiful mountain view and from the front deck you can watch the sunset. This was are second year in a row using Cabins USA. We will be back! I am so happy to hear that you enjoyed your stay in Adventure Lodge and were even able to see some of the area wildlife! We here at Cabins USA work hard to make sure each of our guests have the best stay possible while vacationing in the Smokies. When you are ready to stay with us again, please mention you are a return guest for an additional discount. Thank you for choosing Cabins USA and we look forward to having you as our guest again! We absolutely loved our stay at Adventure Lodge. It is beautiful and spacious! I have stayed at several cabins in the Smokies and this cabin has the best views that I have seen so far! The location was perfect, not too far from town, but far enough to feel like you are in the mountains! The only complaint that I have is a minor one, there was an issue with my express check in and it took several hours for someone to finally fix it. Thankfully it was resolved before I arrived in Piegon Forge. Check out was hassle free. I will definitely consider this cabin again in the future and booking with cabins USA. Cabin was beautiful with a view to match . We are avid pool and dart players . The cabins lacks a high end dart board and the pool table was ready for the trash as it was a very worn out cheap table . Addition of a high quality pool table and dart board would only enhance the visitors experience at this cabin . Yes , I would stay here again but would be looking for a cabin which enhances our cabins time with games we enjoy playing though . Like I said , the cabin and view is beautiful . I don't generally take the time to write reviews, but we absolutely loved the cabin!!! The reviews I read prior were not exaggerating at all... The view was simply amazing!! The upstairs suite with loft was fantastic, the space throughout, the kitchen amenities, everything was perfect! Enjoyed the game room with video game system, pool table and outdoor hot tub too! It is a wonderful cabin. We were a total of 2 families (9 people) and fit perfectly. The cabin sits on the side of the mountain, but it's a bit rough out there so the kids weren't able to hike outdoors (lots of thorns). There are alot of "mountain bugs" so it wouldn't hurt to screen in one of the porches, preferably the first level where the hot tub is :) It is a moderately steep drive to get to the cabin, but because there was no snow, it felt very safe in our minivan. We absolutely loved the location, as it was close to everything (restaurants, Food City, etc), and even better, it sits on a cul de sac. However, you have many neighbors close by. By no means will you feel lonely or isolated. Oh, the GPS does not pick up Adventure Lodge address, so don't do express check in,,,,, go to the office and get a map. Thank you for taking the time to let us know about your recent stay in Adventure Lodge! We here at Cabins USA work hard to make sure that each of our guests have the same great stay you enjoyed while vacationing in the Smokies. When you are ready to stay with us again, please mention you are a return guest for an additional discount. Thank you again for your review and thank you for choosing Cabins USA! WOW! Wonderful cabin in every way. We will be back. We enjoyed the cabin. We had plenty of room. The view from the cabin was great. Everyone had a nice stay. Thanks so much! I am so happy to hear that you enjoyed your stay in Adventure Lodge! When you are ready to stay with us again, please mention you are a return guest for an additional discount. Thank you for choosing Cabins USA and we look forward to seeing you again soon! This cabin is in a great area and is simply amazing! Stunning views and all the amenities anyone could want in a cabin. My family had a wonderful time! We had 2 adults and 3 children. This is our 2nd year using Cabins USA. Thank you for continuing to choose Cabins USA and I am so happy to hear that you enjoyed your stay in Adventure Lodge! We work hard to make sure that each of our guests have the same great stay you enjoyed while vacationing in the Smokies. Thank you again for choosing Cabins USA and we look forward to seeing you again soon! Our family loved the Adventure Lodge cabin. I really appreciated the /wi fi and the pool table and arcade style game was a big hit, The view was spectacular. We used the kitchen a lot. The only thing we weren't sure of was the house keeping services that we were or weren't supposed to have. This could be better explained at check in. We didn't need them all week, and still don't know if they were supposed to be there at all. We never did see them if they were supposed to check once in a while. I am so happy to hear that you enjoyed your family enjoyed their stay in River Adventure Lodge! We here at Cabins USA work hard to make sure that each of our guests have the same great stay you enjoyed while vacationing in the Smokies. I apologize that our housekeeping services were not adequately explained. Our housekeepers make sure that each cabin is cleaned prior to arrival and then they do not go back out to the cabin until the guest has checked out. We will make sure that our guest service agents explain this better in the future. Thank you again for your review and thank you for choosing Cabins USA! We loved the cabin, and the view was fabulous! This was a 4 generation get-away for us and the cabin made it even more special! This is the 4th time we have stayed with Cabins USA and will continue to use Cabins USA. Thank you for everything! Keep up the great work! Thank you for all of your kind words! We here at Cabins USA work hard to make sure that each of our guests have the same great stay you enjoyed while vacationing in the Smokies. When you are ready to stay with us again, please let our reservationists know you are a return guest for an additional discount. Thank you again for your review and thank you for choosing Cabins USA! We had a great time. The cabin was super clean when we got there. The view from this cabin is spectacular. The drive to this cabin is steep so during the winter could be difficult. Thank you for all of your kind words! Our housekeepers work hard to make sure that each of our cabins are thoroughly cleaned and fully stocked so all our guests have to do is walk into their cabin and start relaxing. When you are ready to stay with us again, please let our reservationists know you are a return guest for an additional discount. Thank you again for your review and we look forward to having you as our guest again! This is our 7th year at the smoky mountains, and this has been the best view by far! It was an amazing view of the mountains. In our opinion, this is one of the best cabins we have rented. You will not be disappointed. Thank you so much for choosing Cabins USA and I am happy to hear that everyone enjoyed their stay in Adventure Lodge! We work hard to make sure that each of our guests have the same great experience that you enjoyed while vacationing in the Smokies. When you are ready to stay with us again, please let our reservationists know you are a return guest for an additional discount. Thank you again for choosing Cabins USA and we look forward to seeing you again soon! We really enjoyed the cabin. The location was good. The cabin had plenty of space. There was 5 of us staying there. We had a great views from the decks. We enjoyed playing pool, checkers and the video arcade game. Everything went smoothly. I am so happy to hear that everyone enjoyed their stay at Adventure Lodge! When you are ready to stay with us again, please let our reservationists know you are a return guest for an additional discount. Thank you for choosing Cabins USA and we look forward to having you as our guest again! This cabin was beautiful ! Lots for the kids to do and plenty of space for everyone to have their own little area. It also had some awesome views. Our only complaint (which is out of the company's control) is that it's off the beaten path so lots of critters (raccoons) and large bugs. The front and back porches could of used a wash just to get rid of some of the cobwebs. Overall however great cabin. We love cabins usa this our our second time renting from them. We got married this last visit and all our friends and family rented with cabins usa and they were all super happy with their cabins as well. Keep up the great job ! Thank you for taking the time to let us know about your recent stay in Adventure Lodge and I am so happy to hear that you enjoyed your cabin! 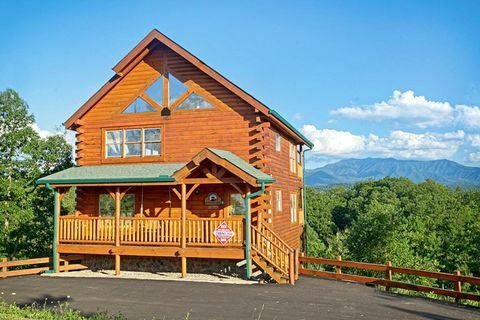 We here at Cabins USA work hard to make sure that each of our guests have the same wonderful experience you did while vacationing in the Smokies. Thank you again for your review and we look forward to seeing you again soon! I got lost trying to find cabin and I called the office hoping for assistance. The rep was No help. She just sighed. I eventually got to the cabin. this cabin was very beautiful. Awesome location we seen fireworks every evening apparently from the Dollywood attraction. Amazing views from all areas of the cabin. close location to everything. will definetly recommend cabins usa to family and friends. Express checkin was the best!! drove straight to cabin just a short delay..(cleaning people just got there at 3 pm right when we where suppose to get in the cabin...so had to wait on them to get started and done... the cleaning guy said it was his fault he had got up late)..but was a very enjoyable, relaxing stay... very pleased!!! I am so happy to hear that you enjoyed your stay in Adventure Lodge! We here at Cabins USA work hard to make sure that each of our guests have the same enjoyable stay that you did while visiting the Smokies. When you are ready to stay with us again, please let our reservationists know you are a return guest for an additional discount. Thank you again for your review and we look forward to seeing you again soon! Thank you for your kind review and I am happy to hear that you enjoyed your stay in Adventure Lodge! Whether you're looking for a cabin with beautiful mountain views or something a little more private, our friendly reservationists are always more than happy to help each of our guests find the perfect cabin. Thank you again for your review and we look forward to having you as our guest again! Cabin was wonderful view was outstanding ! But we did have a few problems along the way . Our hot tub was very clean and it got very warm but it did not blow enough pressure from the Jets , also when we went to use the Jacuzzi inside filled it turned it on it shot out black mold . It also would've been nice to have screens on the windows since the evenings were very nice to get a breeze inside but that was not possible because there were none . I hate to sound pessimistic because we had a very good time and truly enjoyed the cabin it just would've been a lot better if those things were available . This was the best view I have ever had in the 10 years we have been going to Pigeon Forge and the location was awesome. The cabin was really great as well with everything we needed. We really hope to get this cabin again next year! I've been battling NH lymphoma for the past three years and it became very important to make lasting memories with my family. I booked the Adventure Lodge for my husband, two daughters and their families for a week after Christmas. Immediately it felt like "home". The warmness of the wood decor. The spaciousness for the kids to play. The kitchen amenities were great. It had everything and more. There was a little problem with the fireplace but the staff immediately went to work on that problem to get it fixed. I left feeling like I had made some lasting memories for me and my family. I would love to come again. sirens , no traffic noise and no problems. So quiet and peaceful !!!!! My family and I had a great time in this cabin and would gladly stay there again. The view was great and the cabin was beautiful. We loved the pool table and Foosball table. Check in and check out was so easy and the staff was so friendly. We only had a couple small issues that I am sure could not be helped. One was the water pressure. It was not very strong. The other issue was the drive. While we loved the view at the top, the road to the top was a little intimidating. All and all, we would definitely recommend this cabin and Cabins USA. Thank you for choosing Cabins USA. We are delighted you had a great stay with us at Adventure Lodge. We appreciate all your feedback on your stay with us. We apologize for any inconvenience you experienced regarding the drive to the cabin, and the water pressure. The drive to this cabin is steep and curvy. Please always feel free to call us with questions on the location or driving conditions. We do our best to make our staff aware of the driving conditions to each cabin. Also, we will have our maintenance manager look into the water pressure and insure that everything is working properly. We appreciate your business, and we home that we see you again soon. Do not forget about our return guest discount. We have stayed in the Pigeon Forge area several times over the years. I believe this is the forth time we've reserved a cabin through Cabins USA. It's always been a very positive experience for the most part. However, there needs to be some improvement in terms of minor details in Adventure Lodge. The cabin sleeps up to 10 people. There were 8 in my family. There was not enough table sevice (plates, forks, spoons, and knives) for 10 people, let alone 8. The teflon frying pans are so badly scratched that it's unsafe to cook in them (teflon comes off into the food). In addition, there are 3 complete bathrooms, as one would expect in a cabin that can sleep up to 10 people. However, we nearly ran out of toilet tissue by the day we left. It would have been nice to have a few rolls as back-up in case we did run out. It would seem the owner/investors of Adventure Lodge would not mind spending the funds to increase plate and table service settings, and teflon frying pans so large families reserving the cabim can prepare more meals in the cabin versus going to restaurants for every meal. Thank you for taking the time to write you review. We apologize for any inconvenience you experienced during your stay. We are having the inspector inspect the cabin as soon as possible to address the issues you have informed us about. We are sorry that you did run out of the toiletries; however, we only provide a starter supply for each cabin per our policies. We hope that we hear from you again soon. This cabin had everything you needed and more! Close enough to the Parkway and Dollywood yet very private with a beautiful view....definitely would stay here again. I only have one complaint......I didn't get to stay long enough! My family and I had a fabulous time at the cabin and did not want to leave! This is the second year we have rented adventure lodge it's a wonderful cabin with great views! It's always clean and up to date......we will keep trying to get this same cabin every year. Our family loved Adventure Lodge my grandchildren loved the swings on the porch. But our adventure changed real quick when the cabin ran out of water because of a well. Cabins Usa gave us another cabin which we didn't get done moving our stuff until after midnight. All the grandkids fell asleep on the trip to the other cabin. When we got to the other cabin we killed 30+ wasps before we could put the kids to bed. Cabins usa sent a orkin man out the next day to spray the wasps. Both cabins were very nice the second a little to fancy for our family but nice. Cabins USA did all they could to help us in a bad situation and making sure we had a place to finish our vacation. The staff was very helpful in our time of need. Thank your for your review on your stay Nancy. We apologize for the inconvenience during your stay, but greatly appreciate your patience and understanding. When issues happen out of our control we do our very best to make our guest comfortable and happy in way we can. We hope that we will hear from you again. Please feel free to give us a call, and allow us to offer you a return guest discount. Have stayed with Cabins USA for past few years. Adventure Lodge was the most comfortable and the kids loved it. Would recommend this cabin. the house was much smaller than it appeared in the pictures on the web page and the switches for the lighting for the bottom floor was really wierd-the light switches for the bedroom were on the wall in the main room & the same switch was for the flood lights in the main game room & the bedroom; thus if someone was up late playing pool, the lights would be on in the bedroom & vice versa. We had booked this cabin with the intentions of the two teens to sleep in the loft but the mattresses were paper thin & about 2:30 a.m. the boys were looking for other places to sleep. ( 6 adults were using the 3 beds). The pullout wasn't much better so they ended up sleeping on seperate couches. There was only one dining table with 2 chairs & 2 benches in a very tight area so everyone eating together was not in the cards. However, the location was fantatic-only a couple miles from DOLLYWOOD but high enough for a beautiful view and PRIVACY! THOUGHT IT was odd that there wasn't a phone but I guess most people have cellphones. When we arrived the hot tub was only about 1/3 full as it had developed a leak & we could not find a hose to fill it,but after a phone call, someone was there within the hour to remedy the situation. The pool table was in really bad shape but the game machine was quite a hit. The bathroom one the top level was quite unique with the Dutch doors above the jacuzzi tub. (wish that had been our room rather than being stuck on the bottom & sharing a tiny bathroom with horrible lighting & having a horrible time trying to apply makeup). I am not good at reviews but I hope this helps -my son & daughter-in-law said this was their favoritest cabin out of 4 that we have rented , even tho it was the smallest , BUT THEY HAD THE TOP FLOOR! We had difficulties at check-in. First, it wasn't made clear that there are two offices OR which office we were supposed to go to, so we went to the Gatlinburg address, fighting an hour of traffic to get there. There we were told to go to the Pigeon Forge office, so we fought another hour of traffic to get to that office. Once there, we were told our cabin wasn't ready yet (check-in was almost two hours previous, meaning they were well behind schedule) and they didn't offer anything to make up for it or offer an apology for said tardiness. After a long day of driving we finally ended up at the cabin, which was BEAUTIFUL. Exactly as described, if not better. We called the office for a maintenance issue, and they were prompt and helpful. We enjoyed the cabin immensely, and will go back to that cabin AND use Cabins USA again, because we figure that the busy holiday and merging of two offices had them in a tizzy and they weren't rude people. There will be slipups or people behind schedule occasionally! The cabin was amazing. It was exceptionally clean and well-maintained. It had everything we needed. I would definitely recommend this cabin to others!! The cabin was clean, affordable, the beds were very comfortable and the view was magnificent. We thoroughly enjoyed the swings. The booking process and checkout were very easy. We chose this cabin for the amenities it offered in case of inclement weather or simply late night activities. Our 10 year old twins were excited about the arcade game, foosball and hot tub (pool isn't really their thing). We were however disappointed that the arcade game did not work at all when we arrived and called the office as instructed at check-in. We checked in on Sunday, June 2nd, contacted the office at approximately 4:30 p.m. and a work order was opened and our cell phone number given as requested. Regretfully as of Wednesday night, June 5th it was not taken care of so I called the office to cancel the work order, as we were departing the next morning. Needless to say at 9:00 pm (yes 9:00 pm) a repairman showed up to work on it. The gentleman was very nice, but unable to fix it. This was definitely one of the reasons we booked this cabin and we were extremely disappointed that no phone call alerting us of a delay, apology or credit was ever offered. We would certainly book this cabin again, with the understanding that everything be in working order or at least an attempt be made to rectify. The cabin was lovely, but the service in this situation was definitely lacking. Loved it ! We have been renting from Cabins USA for the past 10 years and this cabin by far was the best! It is so nice you won't want to leave ! The views are awesome ! What can I say we loved it ! The cabin is excelent, it is even more beautiful than web showed. I am very pleased to have booked Adventure Lodge, and I am very satisfied with the atenttion of the staff of Cabins USA . The location is beautiful, we had a wonderful stay. There only two aspects to point, as we arrived at night, we realized it should be better if Cabins USA supply a map with the exactly ubication of the cabin, along with the adress, so it would be easier to get the cabin. The second point, if possible in your office make payments by credit card slided live, not only online payments. It was the best cabin we have ever stayed in. And it was very clean and well maintained. Nice cabin... very clean. Our only problem was keeping our 18 month old grandbaby away from the stairs. Other than that we loved it. Awsome cabin! we had a great time and will book again! Absolutely loved everything about it. Excellent rates!! Tastefully decorated and clean. Hot tub, Jacuzzi, New furnishings, Hardwood floors, Flat screen tv's in every bedroom, ton's of space, awesome view espicallyfrom the top level master bedroom, comfy beds, and more!!! What more could you ask for? I love Cabins USA. I have compared prices numerous times and they always have the lowest rates with beautiful cabins with great views. Thanks to Cabins USA for making our mountain vacations possible. If it weren't for their lower rates we wouldn't be planning. It was a very nice cabin if you have children, lots of games to play. We were 3 adult couples so didn't need all that. We ended up being there because of problems in our 1st original cabin, the beautiful and magnificent Take My breath Away...we had to move ;-( it was a very smooth transition ;-) If anyone of the personnel at the office of Cabins USA gets this review, please call, and M. please do what you promised. The Cabin was wonderful!!!! It was very clean. The view of the mountains was magnificent. We had a very enjoyable stay. The only matter that was disturbing is we checked out on a Friday morning and then got a call on Monday from Cabins USA that one of the lamps had been broken with a cost of $75.00. I informed Cabins USA that I had check all the rooms and at the time of our departure nothing was broken. She stated that the cleaning people took pictures. I stated that the cleaning staff could have broken the lamp. She said they had been employed for 6 years . I have booked with Cabins USA for almost ten years and never had such a issue. I just take offense that my truthfulness was questioned. Other than that, it was an enjoyable vacation.